Every day, women across the UK experience sexual harassment, assault and violence. Explore the WEmap to see the true scale of sexual harassment on Britain's streets, place your own pin, and help others to come forward. See how we are taking the true stories of women's experiences and reclaiming the streets using BlippAR. 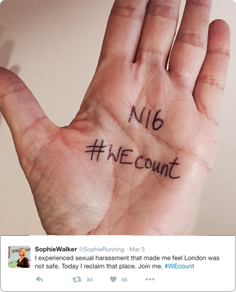 Join others who are speaking out against sexual harassment and violence on Twitter using the hashtag #WEcount. If you yourself have been affected, tweet a photo of your hand with the postcode of the location you want to reclaim, add the hashtag, and make your voice heard. © Copyright Women's Equality Party. All rights reserved Published and promoted by Hannah Peaker on behalf of the Women's Equality Party at Studio 18, Blue Lion Place, 237 Long Lane, London, SE1 4PU.